We all know that there's no such thing as magic. But there was a time not so terribly long ago when the existence of magic, wielded by men of great learning and great piety, was common knowledge, something to be respected and feared. It was very real, it was very potent, and it was everywhere. That's the hook in Darklands, the 1992 Microprose release that was billed as the first "true fantasy role-playing game." Casting aside the usual sword-and-sorcery-scapes so common in RPGs, Darklands is set in 15th-century Holy Roman Empire, with a twist. "Darklands is fantasy because whatever people of the era imagined was possible, now really is possible," Arnold Hendrick wrote in the "Designer's Notes" section that wrap up the game's beefy, beautifully-crafted manual. "Much care was taken to make this world be the real 15th century, as perceived by its inhabitants." It's a world as dangerous and as wondrous as any dungeon master's creation, packed with fantastical creatures, roving bands of adventurers, and plenty of magic, yet one that would also be very familiar to the people of the day. Thugs, thieves, and raubritter, the infamous robber barons who waylay travelers to demand exorbitant "tolls" or worse, are common, as are beasts like bears, boars, and wolves. But the real trouble awaits those daring enough to venture off the roads and into the unknown of the thick, shadowy forests. Giant spiders, werewolves, and tatzelwurm, two-legged lizards with powerful, stinging tails, lurk in the darkness waiting to spring upon the unwary. Hulking, hairy, simple-minded schrat are a constant threat, especially to women, as are the small but vicious kobolds that seek to kill any humans who intrude on their subterranean homes and which grow even more dangerous when ruled by cunning dwarves. Even worse are the hellhounds, gargoyles, and grotesque demons that signal a devil worshiper is nearby - or possibly even an entire cult. Powerful witches cast curses to sow illness and death among frightened villagers, and despite the dissolution of their Order in the early 1300s, even Templars, knights of the most notorious heretical cult of them all, still wander the land. And for those foolish enough to seek them and unfortunate enough to find them, there be dragons lying hidden in the darkest, most remote corners of the land, awaiting Armageddon when they will rise and fight with the forces of the Antichrist. Not creatures of nature, dragons are the embodiment of pure evil, driven by a perversely insatiable hunger. The mere existence of these heralds of the apocalypse spreads sickness and pestilence throughout nearby lands, yet to hunt them is to invite almost certain death. Holding the line against these otherworldly terrors are roving bands of mighty heroes who battle for fame, fortune, and, sometimes, righteousness. 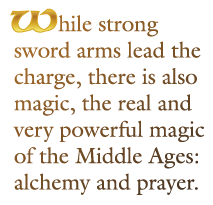 And while strong sword arms lead the charge, there is also magic, the real and very powerful magic of the Middle Ages: alchemy and prayer.